What happened to the squishy little baby that was content to sit around and watch the world go by? (preferably with a good swaddle) This new baby is still (maybe more) squishy, but insists on moving every part of his body at once... all the time. If he is not moving, he is not happy. This makes feeding time a wee bit... difficult. Our house has turned into a giant game of Where's Waldo. As he enjoys being a free range baby, I put Little Man on the floor for five seconds, and he's already squirmed and rolled across the room. 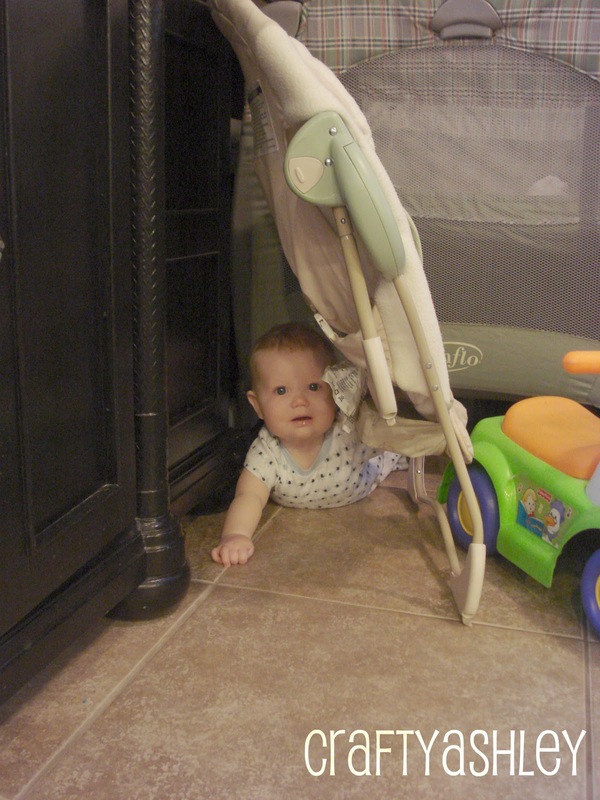 Oftentimes hiding under things like couches, tables, and bouncy seats. I should be worried, right? The mischief starts early? In other baby-related-news, this is the millionth time he's woken up before 6am. This morning? 4:30. I was in the middle of a very nice dream. One where the children were away at grandma's, and I was setting sail for a Mediterranean cruise. I would have liked to finish that. I trudged out of bed and re-binkied the kid. Fell back asleep. Woken at 5:00. Promptly turned off the baby monitor and went back to sleep. When I heard The Husband's alarm go off at 6am- I told him to check on the baby. I then went back to sleep... again. I am aware this qualifies me for the worst mother of the year title. But I'm too tired to care. how in the world is he mobile already?! man, i am NOT ready for that. he's such a doll.